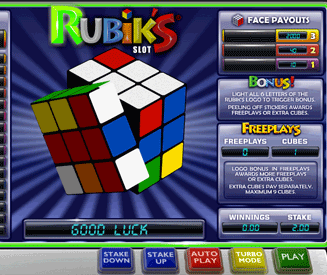 Rubik's Riches is an incredibly addictive slot-based game that has been smashed in to the form of a Rubik’s cube. Normally, I dislike slot-based games where you simply click a button and hope for the best, but Rubik's Riches has some awesome payouts and an amazing bonus round. It is disappointing that you can’t twist the Rubik’s cube for yourself or that there isn’t more interaction with the game. However, maybe that’s a good thing if you think about the number of times you fantasized more about throwing the cube than solving it. Rubik's Riches gets one of the highest fun ratings that I’m ever going to give for a game like this. I wanted to give Rubik’s riches a low score like I did with similar slot-based games like Slotblox and Jenga, but that was before I decided to keep on playing rather than writing this very review. It’s very addictive. In fact, I’m going to go for a few games after I’ve finished. 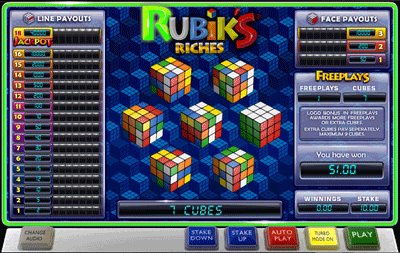 If you take Rubik's Riches for what it is (a funky slot game), I know that you’ll love to play it. Sure, the interactivity isn’t there in any way, but Rubik's Riches makes up for that with a genuinely great fun bonus round and sickly sweet graphics. Rubik's Riches has taken the Rubik’s cube to a better place. It’s half the stress and double the fun. The basics of this Rubik’s cube online game. Set the Rubik’s cube in motion. As I said, it’s just like a slot machine, so you can leave your brain at the door on this one and just enjoy the pretty colours. You can see three faces of a Rubik’s cube in front of you. After each spin, you want to make as many lines of the same colour as possible. Lines can be made horizontally or vertically, which means that up to 18 lines can be made in total in one spin. The more lines you make, the more you will win. If an entire face is the same colour, you win load o’ money again. The more faces the same colour the better. No one colour in Rubik's Riches is more valuable than another, which makes it easier to follow the game. All you have to worry about is making a line of any colour. Making faces (the profitable kind). In addition to lines, you can also win money through complete faces on the Rubik’s cube. As you can guess, you can only make a maximum of 3 faces in one game. The bonus round is best part of Rubik's Riches. It’s fun, exciting and everything in between (whatever that may be). 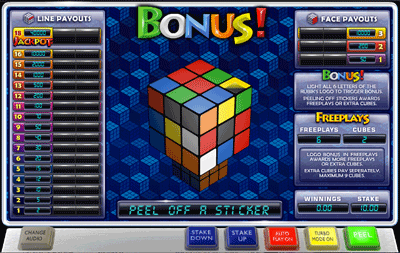 Getting on to the Rubik's Riches bonus round is pure luck, and as far as I’m aware there is no rhyme or reason as to when or why you make it to the bonus round. Freeplays. More free plays according to the number on the sticker. Extra cubes. Extra cubes according to the number on the sticker. You can have up to 9 cubes in one bonus round. Eventually you will peel off a "Start" sticker, which will start the bonus round. The bonus round will run through all of your free plays before it finishes. All of the cubes in the bonus round will count toward wins, which will greatly increase your chances of winning a good amount of money. During the bonus round, the "Rubik’s" bonus word can light up again, and it’s far more likely to happen with all those extra cubes flying around. When this happens, you will be rewarded with more free plays or extra cubes. As I’m sure you’re starting to figure out, the bonus round in Rubik's Riches is pretty lucrative.